THE REVIEW: First things first, while I will try my best to avoid any semblance of spoilers in this review, I can’t promise that what I write will not spoil you in any way. As with Star Wars: The Force Awakens, I instituted Full Media Blackout for Star Wars: The Last Jedi once again to much success. Before seeing the film, I had only read news articles through mid-to-late 2016 and the first teaser trailer. Other than that, complete nothingness. Having now come out of the film, I must say I’m happy I continue the FMB practice for these films — while I can’t know for sure, I fully believe the experience was for the better. My instinct would be to wait to write this review after I let the film sink in a bit and for a second viewing to take place. However, I do feel there’s value in writing initial reactions as they can serve insight later on, as this blog is intended to do. Right off the bat, my initial reaction was, “Wow.” Just wow. I’m speechless in the sense that this was a fantastic film but also in the sense that I’m not entirely sure how to process what I saw. Objectively, I know that this film just flew by. Despite the longest runtime in franchise history, clocking in at 152 minutes, it felt like I left the theater mere minutes after starting. It really felt like a thrill ride, one that despite it’s fast and slow moments never felt like you needed a minute. A lot happens, and most of what happens can be quite unexpected, but I constantly was processing while moving on to the next thing. As I’ve said before, the original Star Wars is my favorite film of the trilogy and that has not changed. It’s equal parts adventure, tragedy, underdog story, and a tale of hope. It’s a story where it’s not really open to interpretation which side you’re supposed to root for. The Jedi and The Force are good while Darth Vader and the Empire is bad. Not a lot of nuance but an entirely new world that has endless paths and possibilities for one to explore. The Last Jedi is not like that. In fact, it might be one of the least Star Wars-y films ever. The Last Jedi is darker. It’s more nuanced. It throws out old conventions. This is not the Star Wars you are used to. And yet, it also has the heart and soul of the story in its DNA. You love it just as much as the original trilogy because it still evokes the same feelings despite being different. The sides are different, Jedi and Sith aren’t meaningless, but they no longer are the same things they once were. Good vs. evil takes a back seat to the characters. Rey (Daisy Ridley) vs. Kylo Ren (Adam Driver), Finn (John Boyega) rebelling against his entire past, Poe Dameron (Oscar Isaac) being forced to deal with how exactly to make an impact in the fight against the First Order. I thought coming out of The Force Awakens that Star Wars was back — a whole host of new questions, characters, and alliances friends could debate. Who are Rey’s parents, how is the Resistance different from the Rebel Alliance, and where in the world did Supreme Leader Snoke (Andy Serkis) come from? The Last Jedi is very much the continuation of the mystery and the unknown. But director Rian Johnson is no J. J. Abrams. It’s not a direct continuation per se… No, it veers hard left and rolls the hard six. Again, it’s one of those things where I’m not sure if it is good or bad, if I like it or not. 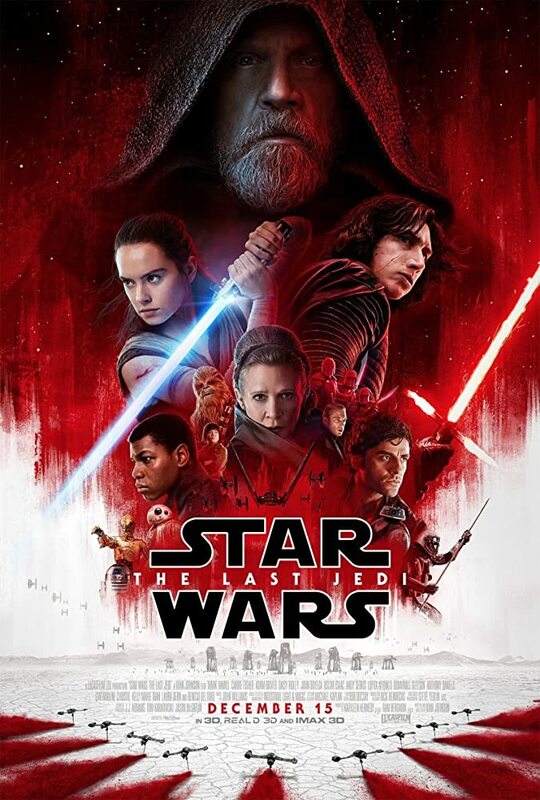 What I do know is that The Last Jedi is familiar but different; something I came out of the theater with an extremely positive reaction to knowing that I have a lot of thinking to do. In a way, having instituted full media blackout makes processing my thoughts and writing this review much more difficult. I’m not exactly sure what to think rather than already having a basis for how to classify everything I just saw. For me it is a stark contrast to the rest of the media I consume and the age of streaming media where you can binge to your hearts desire. My media habits have changed considerably and it makes me long for “the good ‘ol days” when I did these reviews regularly. Everything really blurs together now and I don’t remember standout shows or films as readily as I used to. THE TAKEAWAY: The Last Jedi does stand out though. While my reasons may have been semi-incoherent and not well-formed, I know this is an impactful film. For a lifetime Star Wars fan, this both reinforces the reasons I love this franchise so much while also changing core characteristics. The DNA is the same but it has evolved. Our old creature comforts are now gone and we’re left fending for ourselves in a whole new galaxy. Just as The Force Awakens had many callbacks to A New Hope, so does The Last Jedi to The Empire Strikes Back. It is nowhere near as note-for-note as The Force Awakens was, but some major similarities exist. However, we know where things went from The Empire Strikes Back — Return of the Jedi felt very much in line with the original trilogy. Coming out of The Last Jedi though I’m less sure of where this franchise is going. J. J. Abrams, who is returning to direct Episode IX, may deliver a return to form; another nostalgia trip that tugs at our heartstrings and memories. But I for one would like to see Abrams continue the path Rian Johnson started us down. It is unknown and uncertain, but that is okay. It is incredibly hard to rate a film like The Last Jedi so soon after watching it, because it just feels like a monumental film. Looking back at my review for The Force Awakens, I gave that 5 out of 5 stars and said, “I won’t go so far as to say it’s my new favorite (yet, at least), in large part due to the fact that it still has that new car smell to it… [but it] sets the baseline for this new trilogy and sets it pretty high, yet not insurmountable.” That seems a bit silly in retrospect now, and for similar reasons I’m only giving The Last Jedi four stars now. There are a lot of variables at play now that weren’t before. A lot of questions were raised in The Force Awakens but The Last Jedi throws the entire playbook out the window. In a similar vein, I also said, “I’m eagerly awaiting to see how things play out” with regards to the ending of The Force Awakens, which seems like child’s play now. We had a sense of the size of the ballpark previously, but in Episode IX all bets will be off. Full media blackout is going to reach an extreme difficulty level for that one, and I want to be as surprised as possible going into the finale.